Alexander Ovechkin for two days brought the main trophy overseas. Traditionally, each member of the winning team can spend a day or two with the cup. 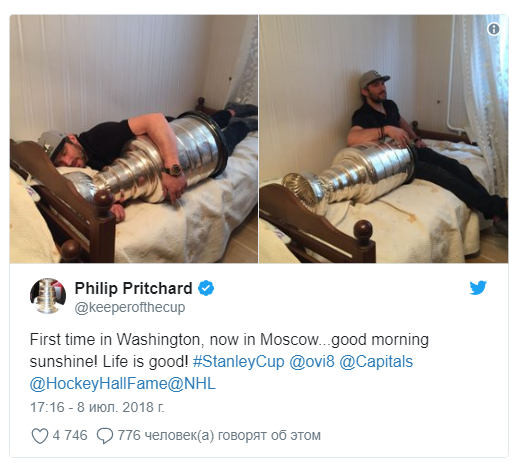 The Russian hockey player took part in the official program, but it did not stop there - in the evening Ovechkin in the company of family and friends once again celebrated the victory of the National Hockey League (NHL). 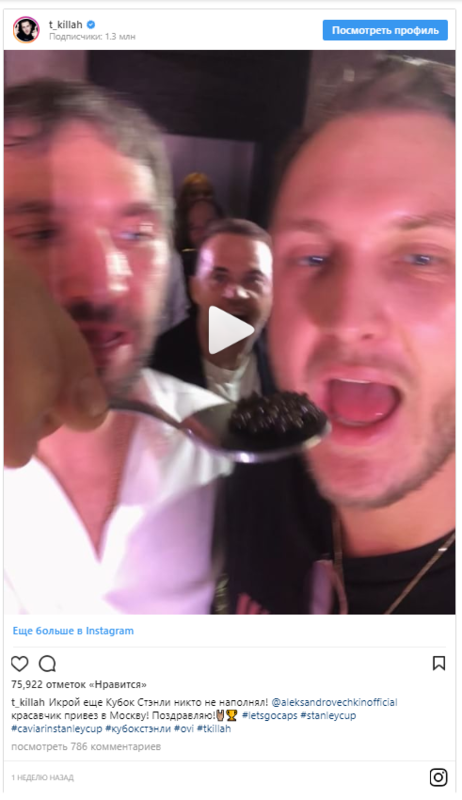 Together with teammates Eugene Kuznetsov and Dmitry Orlov, hockey players danced with Russian pop stars, sang songs and even ate black caviar from the bowl of the cup. 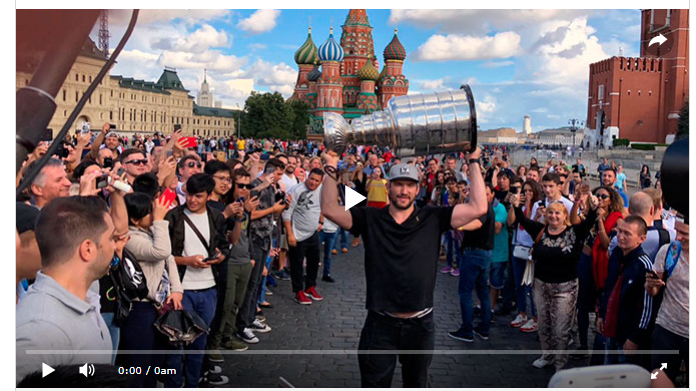 TASS gathered the most interesting footage and video about the Moscow voyage of the Stanley Cup. The NHL trophy arrived in Russia on Saturday afternoon. There was almost a three-hour photo session with the fans. The hockey player was greeted by fans and young athletes of the Dynamo school, as well as Ovechkin's parents. Father, Mikhail Viktorovich, first touched the trophy - after the victory of "Washington" in the United States. On Sunday evening Ovechkin spontaneously brought the goblet to Red Square, where he made some memorable photos. 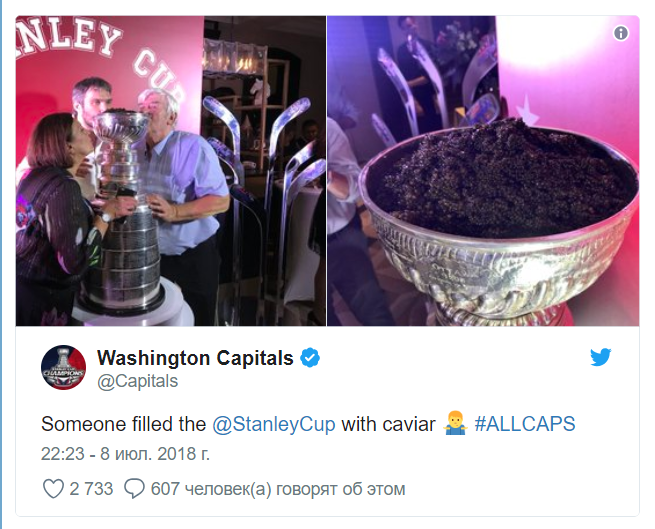 Ovechkin ate caviar and treated his friend, rapper T-Killah, who later wrote in social networks: "No one filled the Stanley Cup with black caviar yet." 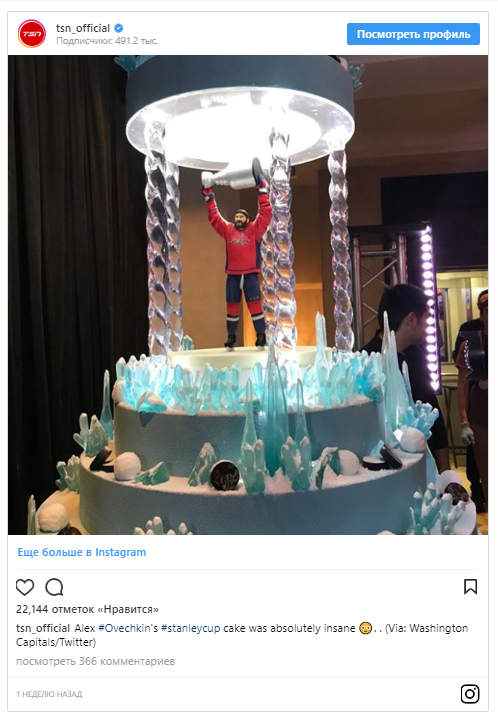 At the event, the hockey player was presented with a chic gift - a cake with a figure of Ovechkin lifting a trophy above his head. 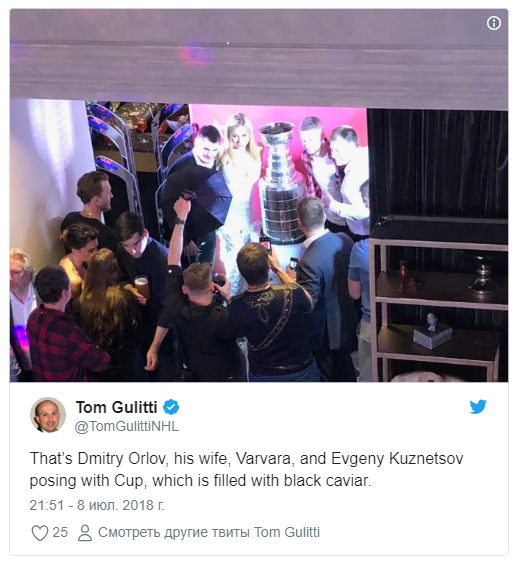 Three Russian players of "Washington" staged a traditional drinking of champagne from the bowl of the cup - Kuznetsov and several friends raised Ovechkin in arms. The Russian player does this not for the first time - a video with a similar action was filmed in the US, after the victory of "Washington." Famous actor Denis Nikiforov met with a friend and even managed to hold the Stanley Cup in his hands. 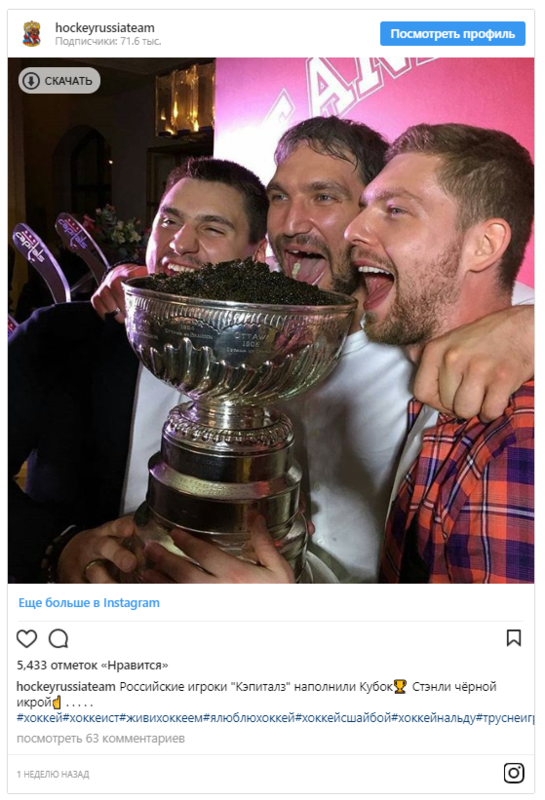 In Instagram, the actor wrote that last year he drank from the cup, brought by the "Pittsburgh" player Evgeni Malkin and coach Sergei Gonchar, and made a wish. Apparently, the actor wanted the victory of Ovechkin and "Washington." 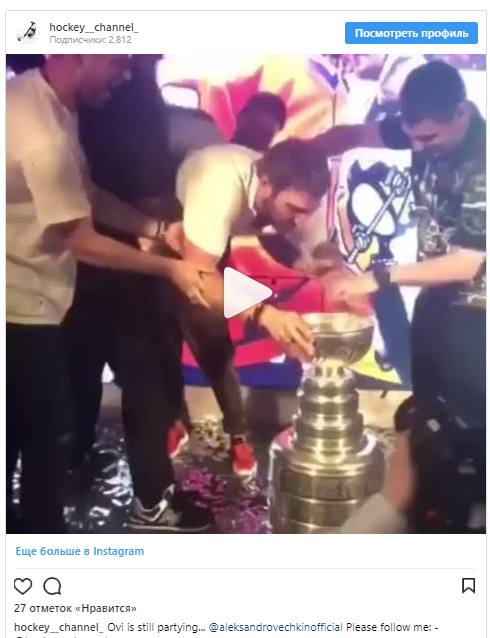 In social networks also appeared a video, as Ovechkin said goodbye to the cup. He neatly put the trophy in a special box, saying in English: "See you next year, I'll miss you." The Cup went to other hockey players of "Washington" on July 9, but the trophy will return to Russia in August. Together with Kuznetsov and Orlov Stanley Cup will go to Chelyabinsk. 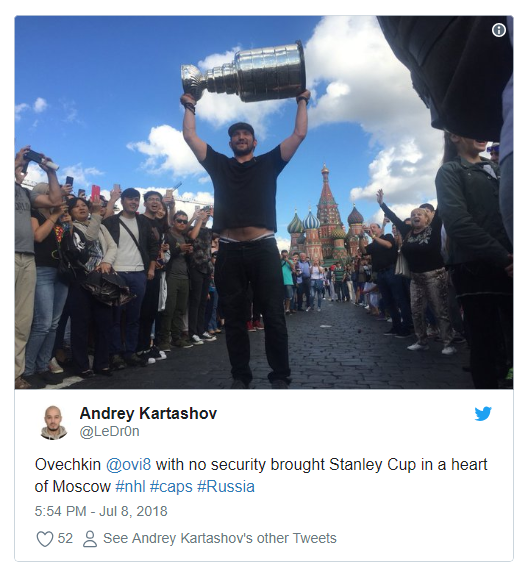 Famous hockey player, striker NHL "Washington" Alexander Ovechkin brought to Moscow Stanley Cup and walked with him on Red Square. As TASS writes, this was an unofficial event. Ovechkin carried the legendary trophy from Manezhnaya Square to the Spassky Tower, where the athlete stopped and took a few photos. On the main Russian square, the hockey player was surrounded by fans who shouted to Ovechkin that they were proud of him that "Russia loves him." "Now it seems to me that it is not heavy at all," Ovechkin said, passing the Cup across the square. 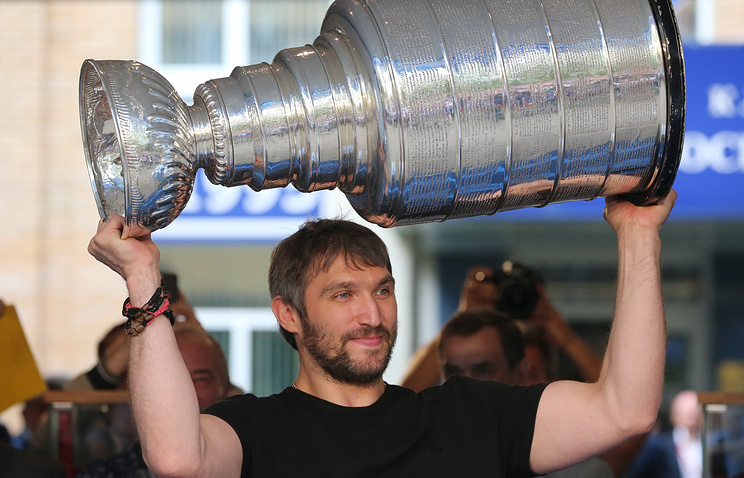 Alexander Ovechkin brought to Moscow the Stanley Cup, which he won with the Washington Capitals. 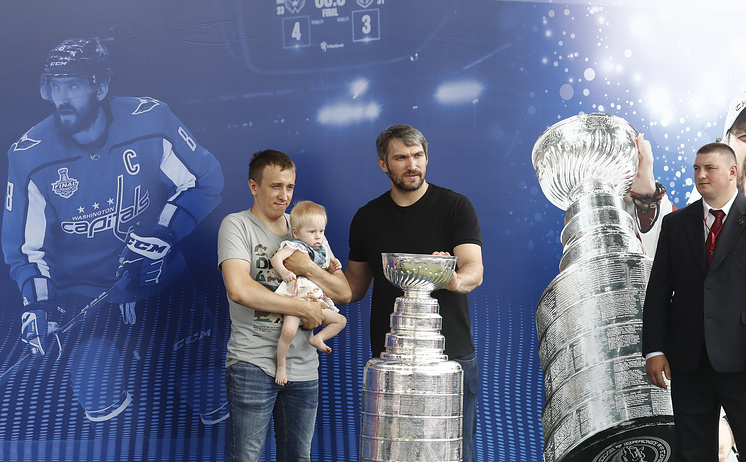 The silver cup visited the Dynamo sports school, the fan zone on Vorobyovy Gory, on Red Square and a closed party, where it served as a vase for black caviar (Ovechkin with parents in the photo). Sunday. The Russian forward of "Washington" continues to celebrate his victory. WHERE WAS THE STANLEY CUP ON SATURDAY? Ovechkin arranged a photo session for the fans, which lasted three hours - unfortunately, there were so many people (several thousand), that most of them did not turn up. Alexander himself, however, later apologized for this problem, noting that he tried to give a chance on the photo with the Cup to the maximum number of people. Then Ovechkin with the prize went to Novogorsk. WHERE IS THE PRIZE GOING ON? On this official part ended: Ovechkin went with the Cup to one of the karaoke bars in the center of Moscow. There he was waited by friends, including: Washington partners Evgeny Kuznetsov and Dmitry Orlov , another former Caps player, famous striker Sergei Fedorov, football player Alexander Prudnikov , basketball player Vitaly Fridzon , as well as famous artists Timati and Katya Lel. And, of course, we will not forget about the wife of Ovechkin Anastasia , who will soon give birth to a child. 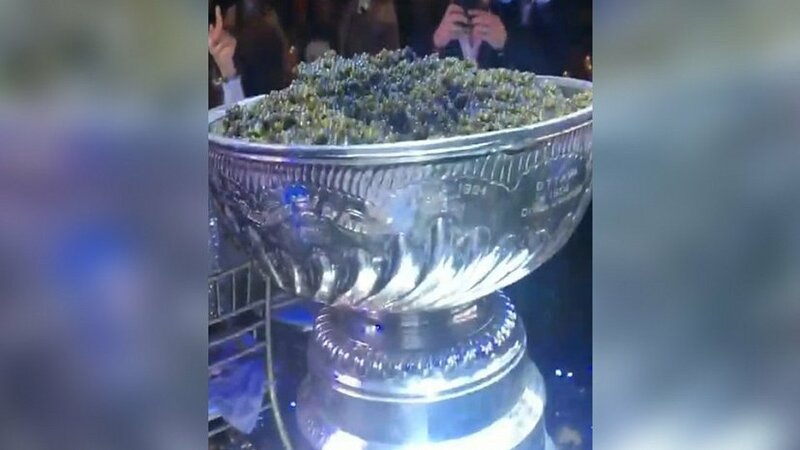 At the same time during the celebration, the Washingtonians drank from the Cup, being in the upside down position - first it was Ovechkin , and then Kuznetsov and Orlov. WHERE WAS THE CUP ON SUNDAY? 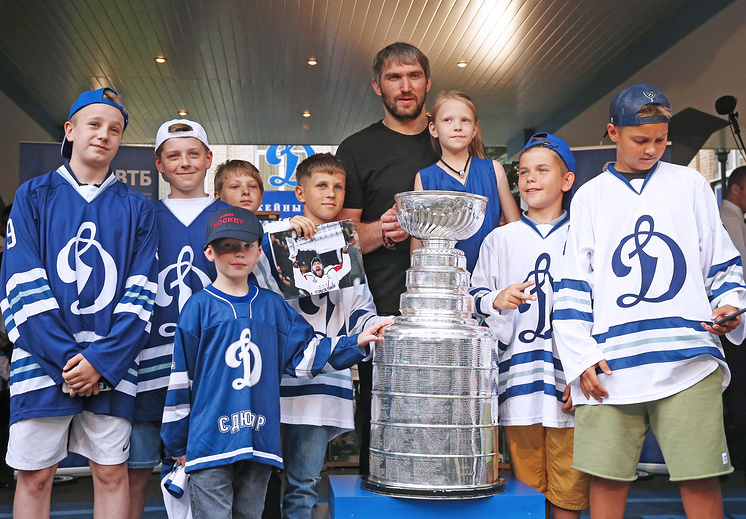 On most Sundays, the Stanley Cup seems to have been with Ovechkin's family , but towards the evening the hockey player made an unexpected surprise to the Muscovites. At about six in the evening he appeared in the center of the capital on Red Square with the prize, surprising and delighting the people who were at that time there. Closer to the night Ovechkin , again with Kuznetsov and Orlov , as well as other friends and relatives, with his wife Anastasia , mother Tatyana and father Michael , again went to celebrate to one of the nightclubs of the capital. There were songs of famous performers, many dances. TThis time the trophy was filled not only with liquid - but also with black caviar! Ovechkin himself noted that at some point he was a little tired of wearing the prize everywhere, but "after a couple of bottles of beer he felt good." On Monday the Cup will go on a new route - together with other hockey players of "Washington". But it will return to Russia - along with Kuznetsov and Orlov . So, Chelyabinsk fans will see the "cup" on August 15 during the Governor's Cup of the region.